Exposure therapy is the concept of exposing yourself to your fears in order to reduce them. Sounds scary, right? Well, it is. But it's not as bad as you might think. In this article, I will explain why this is, and how to do it properly. Irrational fear is, well, irrational. We are often aware of this. However, convincing our body that this is true is often difficult. No matter how much our higher reasoning tells us that the railing keeps us perfectly safe, our stomach doesn't like being on the top of a 100-story building. But, while the lower reasoning centres of our brain are not very smart, they are trainable. The clever part of our brain can be won over by logic, but the rest of it needs to see a situation and learn that it is okay. That is the theory behind exposure therapy. We expose ourselves to the situation that makes us feel uncomfortable to teach our brains that it is safe. It is commonly used in cognitive behavioural therapy (CBT). In CBT, we challenge beliefs. For example, "I cannot go to parties because I will do something humiliating and lose all of my friends". We challenge this by going to a party and seeing that these things do not happen. This is exposure therapy in action. Why should I use exposure? The biggest advantage of exposure is that it works. It works better than anything else we have ever found. Arguably, it is the only way that you eventually tackle your phobias once and for all. There is also something both comforting and confidence-boosting about choosing to do something. Having an anxiety-provoking situation thrust upon you is horrible. Choosing to put yourself in that situation is very unpleasant as well, but often it does not feel quite as bad. Take hospitals, for example. You are going to have to visit a hospital eventually. Someone, including you, is going to get ill at some point in your life. Would you rather confront you fear in your own time, or be forced to face it in an emergency? Neither is pleasant, but most people find that the former is slightly preferable. A key component of exposure therapy is using graded exposure. This means breaking it down into small, manageable steps. Let's say we have a fear of heights. Going up the Eiffel Tower might not be the best option. This is because although you could try, chances are you will back out. This failure will lead you to beat yourself up and think of yourself as someone who is useless. This is not what we want, obviously. Instead, we break it down into small steps. Each one is manageable and builds on the rest. By the end, we are doing things we never thought would be possible when we started. Graded exposure allows us to break tasks down to manageable steps. Let's say that you used to enjoy going to a restaurant with friends. However, now your anxiety prevents you from doing so because you feel uncomfortable eating in front of a group of people you know. How could we break this down into a series of manageable steps? Below, I have outlined a table showing this. On the left is each step. On the right is how anxiety-provoking this idea feels. It forms a hierarchy of fear. Each step is a little scarier than the last step. But there is no rush to go through them. You can repeat each step as many times as you need before you feel comfortable. The anxiety is unlikely to go away entirely. You are aiming to pick tasks that feel like 6/10 and reduce them to say 3/10. Once you have done this, you can re-grade the tasks and pick the next task on your hierarchy. What happens when I get stuck? Finding yourself stuck on a certain level of the hierarchy is a common problem. Anxiety has ups and downs. Therefore, sometimes you will find you need to repeat a step for a long time. 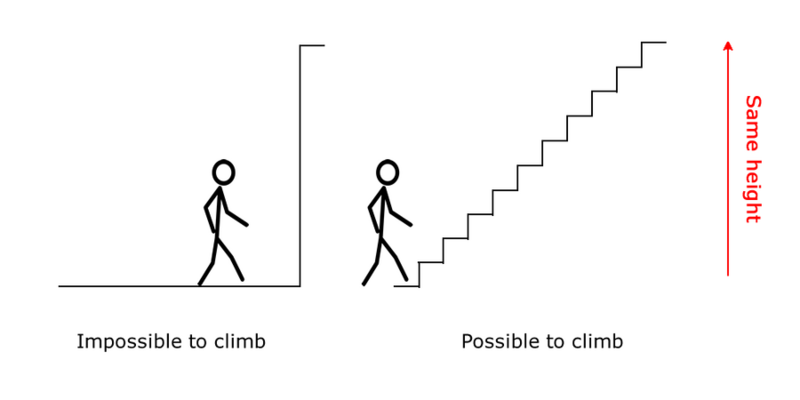 Or, maybe you need to drop down to a lower step and build back up again. Neither of these actions are failures: they are part of the process. Sometimes, you may find that you become comfortable with one step but cannot take the next step. Let's say you dislike public transport, for example. You have mastered getting on the bus, but now you cannot bring yourself to get on a train. The answer is to find a way to break this step down even further. When you find yourself stuck, ask yourself is there is a way to make the next step smaller and more manageable. What happens when I cannot break it down? Sometimes, even this process of breaking it down is not enough. Let's say you have a fear of flying, for example. At some point, you need to get on a flight. Read our article about fear of flying. This may seem like a huge step and one that you cannot break down. Use emotional support. Take someone with you who helps you keep calm. This may make the same experience more manageable. Use medication. The first time you fly, take medication. Your doctor will usually prescribe you a sedative. If you find the experience manageable, try it without the medication next time. Use a proxy experience. Identify the specific worries you have and find a similar experience. For example, your fear of flying may come from heights, or confined spaces, or just the feeling in your stomach. Could you re-create these experiences? If it's heights, you could visit high buildings and bridges. If it is confined spaces, you could practice on trains. If it is the feeling in your stomach, you could try theme park rides. There are a couple of other points you should keep in mind when doing exposure therapy. The first is distraction. Distraction is thinking about something else instead of the situation at hand. Distraction is oven very useful because it allows you to make uncomfortable situations slightly less unpleasant. Read our article on how to use distraction effectively. However, exposure is best done when paying attention to the situation. Why? Because we want to show our brains that there is nothing to fear. We need to be conscious of our experience so that we teach ourselves that although it feels uncomfortable, nothing bad happens to us. Instead, we want to use detached mindfulness. We want to observe the thoughts and feelings we are experiencing, and the situation around us, without being drawn in. We are fully present and take note of the intrusive thoughts and uncomfortable feelings, but try not to let them take control. The second is safety behaviours. These are things we do to provide ourselves with comfort. For example, if you are afraid of the dark you may carry a torch. If you do not like enclosed spaces, you may scout out the fire exits. Or, you may use alcohol to boost your confidence. These behaviours do have a place to initially give you the confidence to complete a task. However, in the long term, we want to teach ourselves that we do not need these things to help us feel okay. Distraction and safety behaviours can provide us with a short-term solution to getting something done. And if you need to use them to get the first step complete, use them. However, you should then go back and do it without them when you can, so that you do not become reliant on them. If you want to conquer your fear, the long-term solution is exposure therapy. It sounds scary, and it is a little bit. However, you never need (or want) to push yourself too far beyond your comfort zone. At each step, you should break it down into manageable chunks and build up to bigger things. Published 5 June 2017. Written by Chris Worfolk.